"Madeira Cove. - The name given to a part of the Marine Parade, which is a wonderfully sheltered and pretty spot, near Manilla Crescent. Here the Town Band plays every evening during the summer, and pleasant it is when at high tide the visitor or resident can stroll or lounge, watching the sailing or rowing boats with which the water in Glenworth Bay is often covered. The Cove facing due south, even in winter it is a warm nook, and on a sunny day people may be seen sitting here reading, shewing that evidently the spot deserves its name." 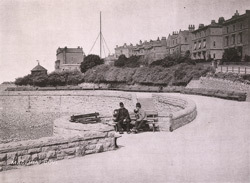 This is the sixth in a series of 16 cabinet card views of the town published in the book 'Weston-Super-Mare Photographed.' In the 1880s Cabinet Card photographs completely replaced the smaller carte de visite format. As the name suggests, the cabinet image was large enough to be displayed on a side table or bureau. They remained in vogue until the turn of the century when they were superseded by the photographic picture postcard.